Lorado Taft (1860-1936) created this artwork, which consists of four limestone figures, ranging from 5' to 7' high. It was purchased in 1937 from the Lorado Taft Collection. 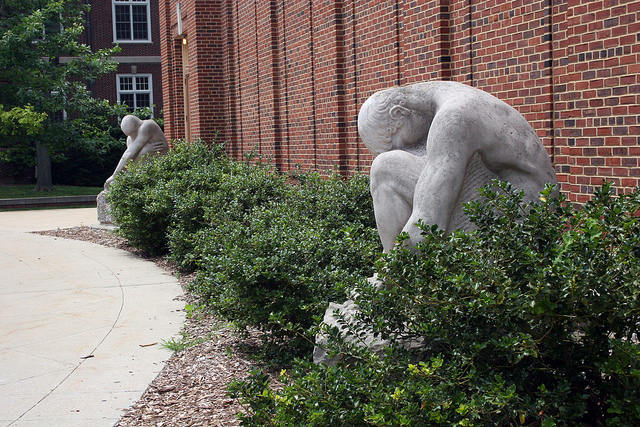 The sculptures can be found on the south side of Foellinger Auditorium. From 1910 throughout the rest of his Life, Taft hoped to beautify the old Columbian Exposition Midway Plaisance in Chicago by creating a mile-long expanse of trees, lawns, fountains, and "statues of the world's greatest idealists." A fountain of Time would be at the Washington Park end, one of Creation at the Jackson Park end, and, between them, lagoons and bridges with sculpture symbolizing Science, Art, and Religion. 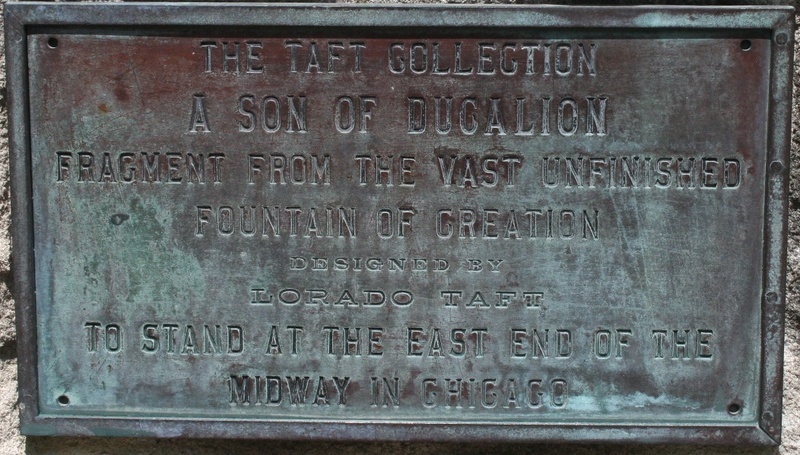 Due to a lack of support for the project, only the Fountain of Time, which many consider Taft's masterpiece, came fully into being. Taft began the artistic process for a fountain of Creation with a tiny plaster maquette first exhibited in his studio in 1910. About forty figures, each approximately 2 and a half to 5 and a half inches high, were arranged in fourteen single-or multi-figure parts; their final size was to have been about 10 feet high, with the fountain measuring about 70 by 40 feet. Water would rise up around the groups, form mist, and flow to suggest great floodwaters, imagery derived from the Noah-like Greek myth in which Deucalion and Pyrrha, the only two people left on earth after a deluge, consult "a convenient oracle as to the best way of restoring the human race." They are told, in Taft's words, "to cover their heads and throw the bones of their mother behind them." In his maquette, the sculptor shows us the moment when these "bones," which Pyrrha perceived as the stones of Mother Earth, are changing into men and women, who materialize from the cold and flood into life and light. Most notable of Taft's several versions of the figures are the four full-size statues at the university. Under Taft's direction, Walter Zimmerman, a Chicago sculptor, carved the two males and two females from Indiana limestone for the Century of Progress exposition in Chicago in 1933. Massive, dynamic, seemingly incomplete, they metamorphose out of rough-hewn boulders-in the fashion of Michelangelo or Rodin-into human form. ln 1945, classics professor William Oldfather discovered misspellings on the sculptures' explanatory plaques. He informed the director of the physical plant about "'Pyrrah' (for Pyrrha) and 'Ducalion' (for Deucalion)," assuring him that "I am thoroughly familiar with what I am talking about in this letter, because Deucalion and Pyrrha have been for many years one of the chief concerns of my research. The spellings given above in quotation marks are unqualifiedly incorrect for English," he chided, "the language in which the texts on the plaques are composed; and equally incorrect for Greek, in which language these names were first used; for Latin; for German; for French; and for Italian, these being the six languages with which most educated men are familiar; and I have no doubt that the spellings are incorrect also for other literary languages. I hope something will be done about the matter. It would be far better, in my judgment, for a University to have no explanatory plaques at all, than plaques which tend to make it ridiculous." Two things are certain: Foreign-language requirements are not what they used to be, and the plaques remain misspelled. Muriel Scheinman, “Sons of Deucalion and Pyrrha, 1933,” ExploreCU, accessed April 20, 2019, https://explorecu.org/items/show/18.